Yes, Marilyn, you are attending President Kennedy’s birthday celebration at Madison Square Garden in New York. But that does not mean you have to wear your birthday suit! Instead, Monroe commissioned a super special gown from French-born Hollywood designer Jean Louis for the occasion. A real stunner. And it’s soon for sale courtesy of Julien’s Auctions in Los Angeles. 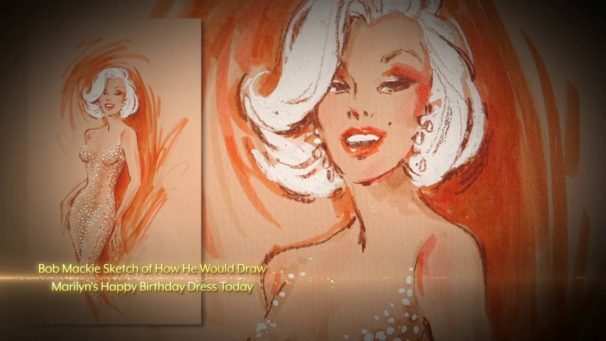 Reminiscing in a fabulous video, Bob Mackie, the designer of bling, describes his early sketches for the dress while working for Jean-Louis. The two men were designing an insanely skin-tight, nearly see-through-save-for-stuck-on-rhinestones sheath for her notorious appearance on May 19, 1962. On August 5 of that year, that dear woman would be dead. In the video Mackie explains, with great charm, how he came to work for Jean-Louis, the Hollywood costume designer who worked so closely with the choreographer Jack Cole in giving Rita Hayworth pizzazz in, among other films, GILDA. Mackie also lets drop the name of dressmaker Elizabeth Courtney, who made the hand-stitched wonder, an unspeakably precious garment, which will be sold at auction this coming November. Just for fun, Mackie put his hand to paper and sketched how he would create the costume sketch of MM in her gossamer gown today. In a very nice gesture, Julien’s is donating proceeds from a public exhibition of the dress (admission: $25/person) to the Downtown Women’s Center. How nice is that? And how much would MM like it? I think a lot. newerIt’s cool. You’re cool. So go. AfterParty @ The Wallis. Should be delightful – I wish I could be there!